We cut lapidary slabs from rough & buy from old timer rock collections. Our focus is high quality stones with unique scenes, eye catching colors, & interesting patterns. Enjoy Shopping! This is a nicely decorated Tiffany Stone Lapidary Slab from Utah. Also known as Bertrandite. It is actually opalized fluorite and can produces beautiful jewelry. Measurements are 2.5x5x3/16 inches. Photographed wet. This is a South Africa densely banded Tiger Eye Lapidary Slab with good quality chatoyance. Measurements are 3/16x3x3.5 inches. Photographed wet. This Tiger Iron Lapidary Slab is from Australia and features colorful bands of red hematite, yellow tiger eye, and jasper. Measurements are 2×4.5×1/4 inches. Photographed wet. This is a nicely decorated Tiger Tail Jasper Lapidary Slab from Mexico featuring red, yellow, and black waves of color. Measurements are 2x4x1/4 inches. Photographed wet. This is an excellent West Texas Plume Agate featuring large distinct black and white plumes embedded in white to clear chalcedony. Classic! Measurements are 2x4x1/16 inches. Photographed wet. This interesting Wonderstone Lapidary Slab is a blank ready for cabbing. It’s solid and measures 3/16 x 1 x 1 5/8 inches. Photographed wet. 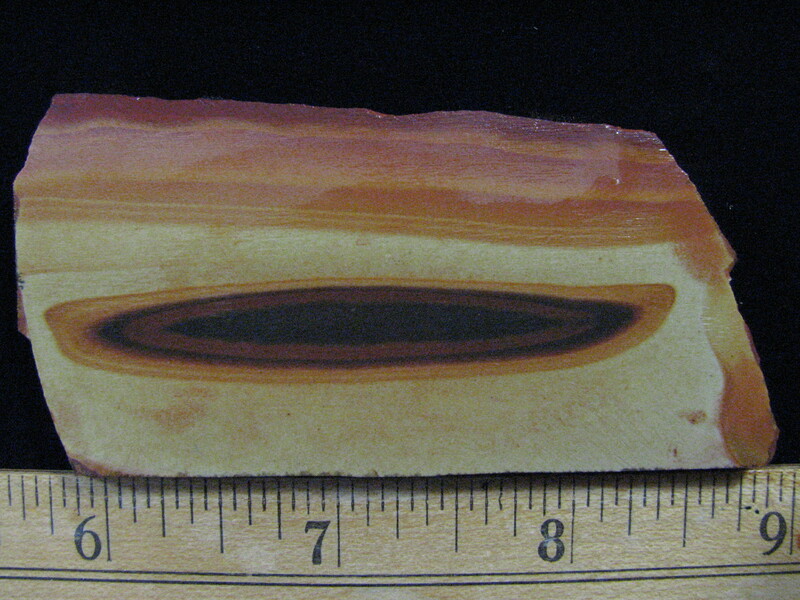 If you are interested in bolos this Wonderstone Lapidary Slab is for you. It features a 2.5 inch long elongated oval with a black center and three brown to tan outer rings. It’s from Utah. Measurements are 1.5×3.25 inches. Photographed wet. This Wonderstone Lapidary Slab features a black core surrounded and accented by various shades of brown matrix formations. This Wonderstone is from Utah and will produce a good cab. Measurements are 1/4x2x2.5 inches. Photographed wet. 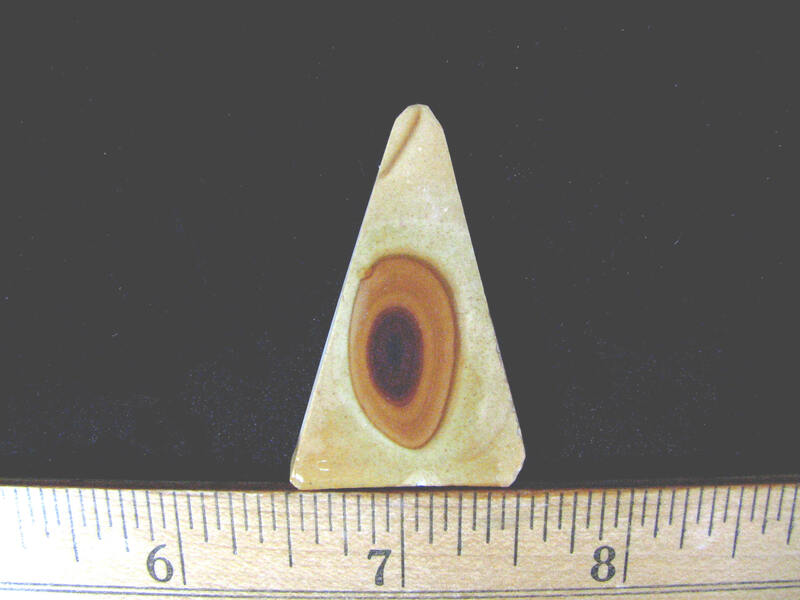 This small Wonderstone Lapidary Slab from Utah features a solid black core surrounded by light brown bands. It has a nice rustic look and will polish well. Measurements are 3/16x.75×2 inches. Photographed wet. This is a Zoisite Lapidary Slab with very faint signs of ruby. Even so, it should produce very nice green and white banded cabs. Measurements are 2.5×3.5×3/16 inches. Photographed wet.